Loaded with cheese and white chicken chili. Need I say more? 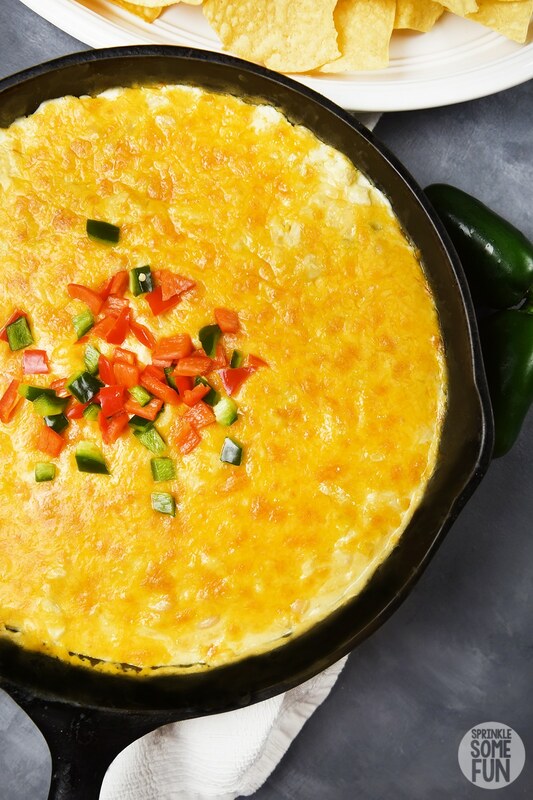 White Chicken Chili Cheese Dip is one of our favorite go-to dip recipes when we are having a get together. 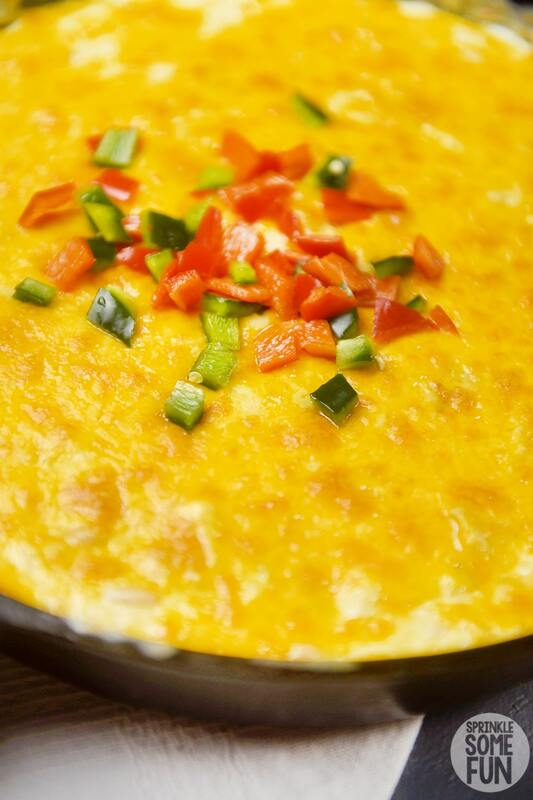 It’s a great change up to traditional nacho cheese and it always receives rave reviews. Delicious white chicken chili is loaded with cheese and thickened up to make this yummy dip. 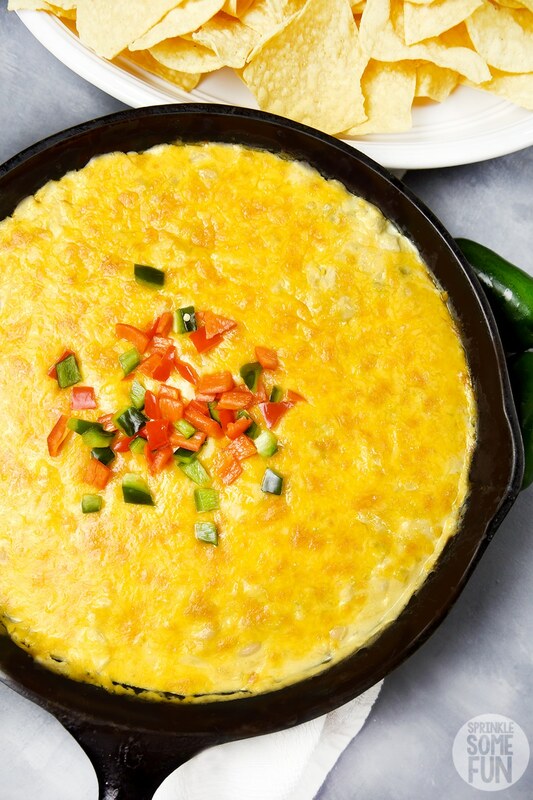 This dip is best served with thick corn tortilla chips that can hold a chunkier dip. 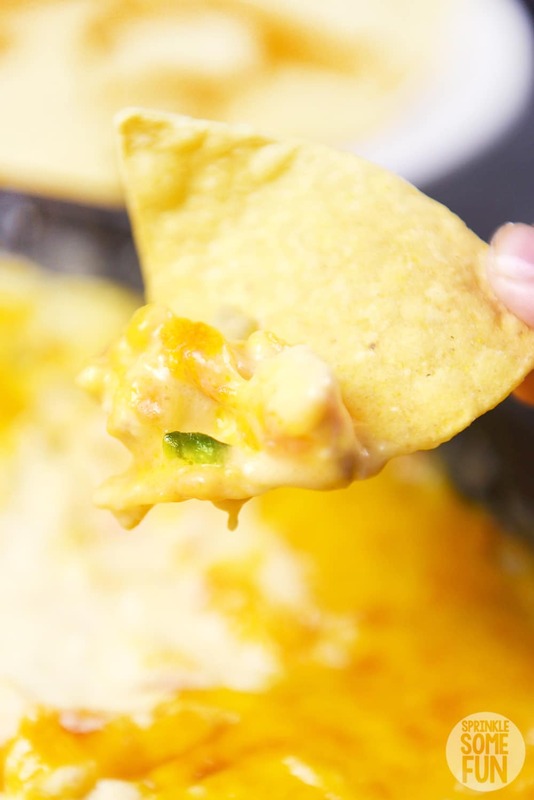 I love to make this dip on the chunkier side so that it fills up the whole chip. Yum! Cast Iron Skillet. My favorite cooking vessel to make this in is a cast iron skillet. Cast iron can go from the stovetop to the oven and it makes clean up a bit easier to only have one dish. If you don’t have a cast iron skillet, you can make this in any skillet that is also oven safe or you can use a casserole dish for the last step. 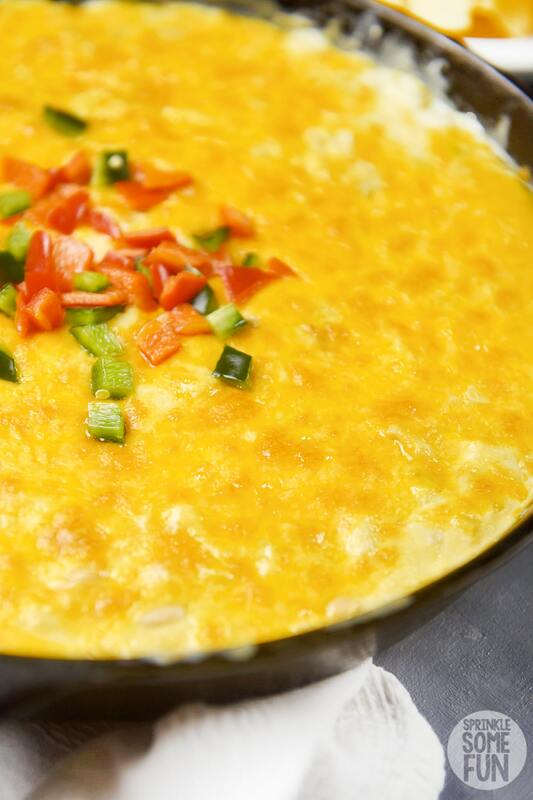 I think the dip looks nice in the skillet, but NO ONE will care what you cook it in! They will only care about how fast they can get it into their mouths. Potato Masher or Large Spoon. One important step to making this dip is to make sure to mash the chicken and beans up into smaller pieces. I mention below that you can either use diced chicken or cook the chicken ahead of time and shred it. Shredding the chicken will make the dip easier to scoop up, but dicing the chicken will make a chunkier dip. It’s up to you with what you prefer. The potato masher or the back of a large spoon will help to mash some of the bigger pieces and beans down so they will be easier to scoop up. 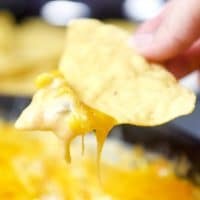 Let’s talk about the cheese and what types are best for this dip. I like to use a sharp cheddar cheese because I think it packs a lot of flavor without overwhelming the dish. Other cheeses you could try are Monterey Jack, Colby or a blend of Mexican Cheeses. 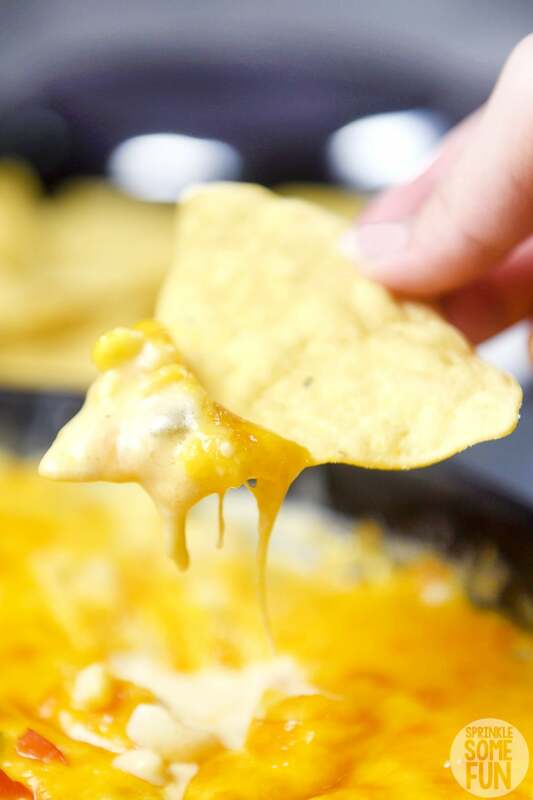 All of those cheeses will taste really yummy in this dip. What sets this dip apart from traditional white chicken chili is that it is much thicker and creamier. White chicken chili is very soup like and you don’t want that for a dip. When adding the cans of beans and other ingredients, it’s important to make sure that the water is fully drained before adding them into the skillet. The chicken in this dish can be made ahead of time and shredded or diced and cooked with the onions as you are making the dish. I created this recipe to include both ways so that you can choose your favorite. I personally don’t like to take the extra step of shredding the chicken up. Plus, as I said earlier, I love chunky dips and with diced chicken it is definitely chunky! White chicken chili cheese dip gets a lot of the flavor from the cumin and green chilis called for in the recipe. That’s really what sets white chicken chili apart from beef chili in looks and flavor. Instead of red chili powder the green chilis add all the chili flavor it needs. I guess green chicken chili didn’t sound as appealing. haha Plus, the dish is technically white from the cream cheese. As much as I love eating this as a dip; I don’t think anyone would blame me if I just scooped it out and ate it in a bowl. Another way of serving it is to make nachos. Just pour the mix on top of the chips before adding the cheese and then sprinkle the cheese on and bake. That would make some yummy nachos for sure. In fact, I think I will try it that way next time I make it. The hardest part is waiting for the guests to arrive if we are making this for a crowd. It always smells so good and of course tastes great right out of the oven. If we are having several guests we make sure to have a double or triple batch because it will run out quickly. 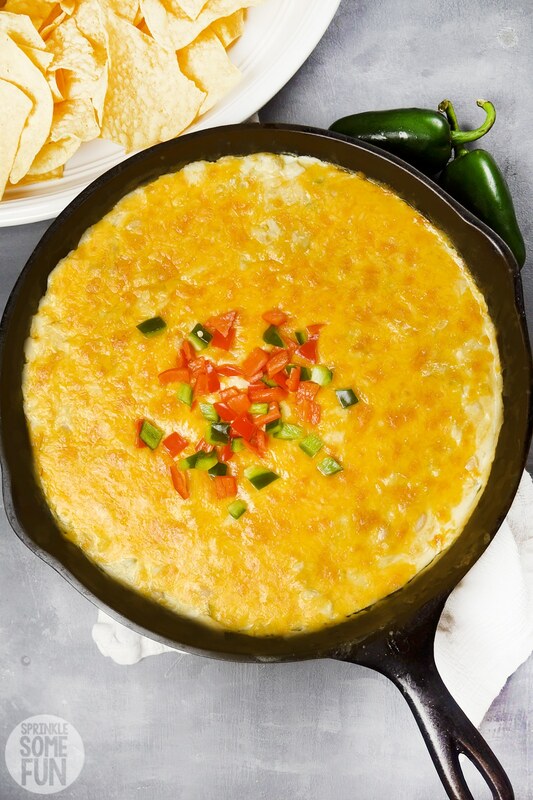 Chances are, if you were to come to my house for a party, I would serve up this dip or restaurant style queso dip. They are my favorite easy dips to make for a crowd and I hope you will love them too. 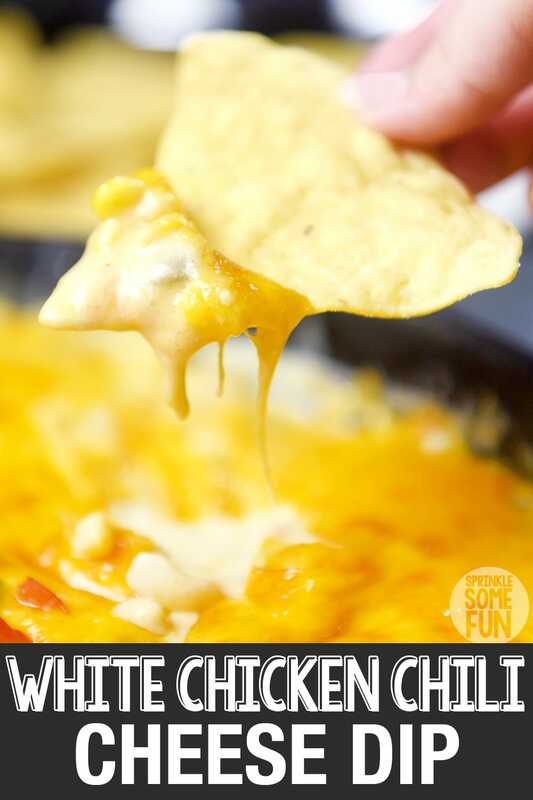 If you LOVE this White Chicken Chili Cheese Dip Recipe as much as my family does please give it 5 stars below in the comments. 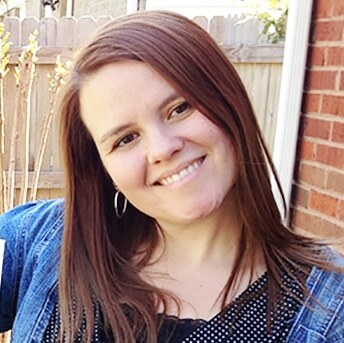 Follow me on social media, so you never miss a post! Delicious white chicken chili is loaded with cheese and thickened up to make a yummy dip! This is such a crowd please and a great appetizer dip. Preheat oven to 400. In a large skillet on medium heat add oil and onions to the pan. Cook onions until they are sweating. Add the diced chicken or if you are using shredded chicken add it now. Cook the chicken thoroughly. Pour the green chiles, beans, corn,cumin and cream cheese into a large skillet and cook on low heat on the stovetop for around 10 minutes or until everything is mixed well together and creamy. At this point take the back of a spoon or a masher and mashed the beans and chicken up a little to thicken up the dip. I like my dip chunky, but you can mash even more for a creamier dip. Next, Pour the cheddar cheese on top and place in the oven for 5 to 10 minutes or until the cheese is bubbly and starting to brown at the edges. Serve immediately. Serving suggestions: place cut up bell peppers or your favorite peppers on top and serve with tortilla chips. This dip is best served hot!